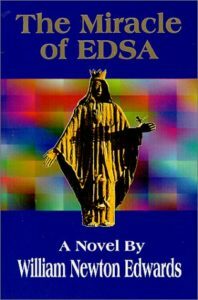 The Miracle of EDSA is a story of a mother’s love, a people’s struggle for freedom, and the many Miracles which took place at a time of both near-civil war and religious devotion. When Leigh Jackson, a beautiful Filipina-American nurse, is told by her sister that the child she thought died at birth is still alive, a grown man, she travels back to the Philippines in search of her son. Her ex-lover, Dan, comes back into her life, and they rekindle a passionate love affair. Miguel, the fierce guerrilla leader, makes Leigh an unwilling part of his small band, where she nurses the sick, but must also fight for her life in hand-to-hand combat. General Navarro, Leigh’s evil antagonist, causes her and countless others to suffer torture in his infamous dungeons. Virgil, Leigh’s heroic young nephew, who believes that prayer can stop tanks, leads the non-violent resistance to the government. Marci and Paulita are courageous women freedom fighters who prove that not only men can risk death in a great cause. This powerful tale of miracles great and small is based upon real events that took place during the Filipino people’s uprising against tyranny. As Leigh searches for a second chance at motherhood, and a renewal of the deep love she and Dan had once known, she learns to fight, to survive, and most importantly of all, to believe. The result of her quest is a symbol of peace and redemption in the midst of war. … B-movie legend Roger Corman has landed the rights to “The Miracle of EDSA” (Milrose Publications), Col. William Edwards’ historical (fictional) thriller. Corman will produce the flick under his Concorde/New Horizons banner. “Miracle of EDSA” is about an American nurse who goes to the Philippines in search of her long-lost son – only to get caught up in a guerilla uprising. Corman is eyeing Sigourney Weaver for the lead, with Francis Doel writing the screenplay.